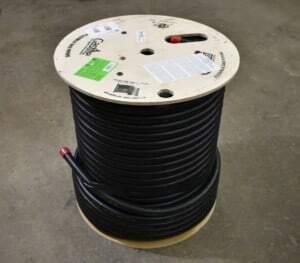 As the owner of a successful Gas Piping Installation Company that has serviced the Portland Oregon Metro for almost 2 decades, I’m going to use real numbers from literally thousands of gas piping installation jobs we’ve bid & completed over the years to give you a solid idea of what you should expect for average costs to have a new gas line installed in your home. Currently, our company performs an average of 20 or more residential gas line installations per week, and that’s not including our commercial gas piping work. We have plenty of marketing materials in place and a great referral network, you won’t see any “sales stuff” in this Blog. I have always been passionate about my work, my Blogs are a hobby and an outlet for me to share my knowledge and hopefully help a few people make educated decisions. I’ll also cover some basic questions to ask your potential Gas Piping Installation Contractor up front to make sure you’re getting high quality and safe flexible gas line piping products. Every Contractor that installs gas piping is trying to make a profit, that’s just the nature of the beast and certainly doesn’t make them bad people (I’m a good person!). Safety & quality MUST come first, especially in regard to flexible gas piping! 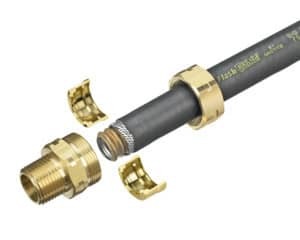 Unfortunately, there are several brands of “CSST” (Corrugated Stainless Steel Tubing) flex piping that really just don’t make the cut in my opinion, and flammable gas line installation is definitely not a trade that should ever be cutting corners to save a few bucks on materials or labor. You already have Natural Gas in your home and simply want a new gas line installed for a gas range in the kitchen, or a BBQ out on the back deck, maybe a new gas clothes dryer, etc. Before calling any Gas Piping Installation Contractors for a quote, do a little bit of homework yourself. You’ll sound more informed and be able to weed out the “shady” Contractors right off the get go, and you will have the information readily available for any potential Gas Piping Contractors to give you a solid bid or at least a ballpark quote. Gas piping is sized by the BTU load of ALL appliances on the gas system, inside diameter (ID) of the gas piping, type of gas piping whether it’s black iron or csst or a combination of both, and length of each gas “run” of piping from the gas appliance back to the Gas Meter. The first thing you need to know is the location of your Gas Meter. 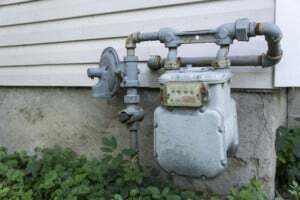 If you’re able to identify the ID size of the pipe “stub” off the meter, that will be helpful in establishing whether your gas system will be able to handle the additional load, or if a new dedicated line will need to be installed directly from the Gas Meter to the new gas appliance. What is the BTU load of the gas appliance you want to add? How far away in feet of gas piping installed (NOT as the crow flies) is the new appliance from the Gas Meter? Remember, gas lines are always sized by length of pipe all the way back to the Gas Meter. Someone who installs gas piping every day will have a solid educated guess on common appliance BTU loads such as clothes dryers or water heaters, but other gas appliances such as Gas Kitchen Ovens & Cooktops can be range from as low as 50K BTU to over 100K BTU easily. Knowing the exact BTU requirements from the manufacturer is key to sizing the new gas line. What gas appliances do you already have? What are the BTU loads of the current appliances? 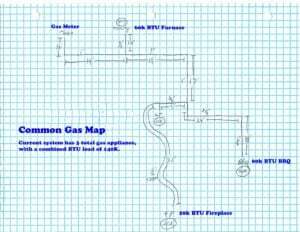 If you can visibly see your current gas lines well enough to confidently draw a sketch of the current gas system starting from the Gas Meter and showing each gas line branch that supplies a gas appliance, that along with the above listed information should be all a Contractor would need to give you at least ballpark pricing without a site visit. Wasted trips for bids on jobs that are not within the current budget are built into a companies overhead and therefore negatively affect end pricing to the customer. If you can get enough detailed information to the Contractor before any site visits are scheduled, you should be able to make a decision on whether moving forward with the project is within your budget. A good Gas Piping Installation Contractor should try to obtain as much information as possible before determining if a preliminary site visit is needed. In many cases, your efforts may reduce overall costs by completely eliminating a preliminary site visit if the Contractor is comfortable estimating & scheduling to have a new gas line installed based off the information you have provided. Quick Tip: while Black Iron = Black Iron regardless of brand, different brands of CSST will actually flow more or less gas volume and therefore affect the line sizing differently among CSST manufacturers. The CSST fittings are also Brand Specific, you cannot use a “Brand D” Flex fitting on a Gastite CSST flexible gas piping joint. If you can visibly see the writing on the CSST jacket well enough to obtain both size AND Brand of CSST currently installed in your home, this would be helpful information to pass along to prospective gas line installation companies. Why do gas line installation costs vary so much between Gas Piping Installation Contractors?? The variance in pricing between Gas Piping Installation Contractors within the same service area is going to be attributed to their overhead costs and ability to complete the job in a timely manner. While you probably shouldn’t randomly ask a company what kind of overhead costs they’re dealing with, I see no reason at all not to ask what kind of tools they use, specifically what type of pipe threader. (Keep an eye out for my upcoming post comparing Pipe Threaders side by side!) 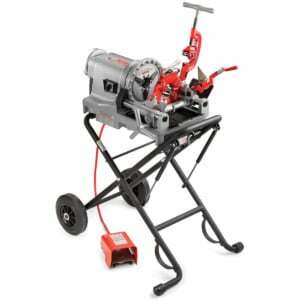 As a Contractor, you can work as hard and fast as you possibly can, but the one variable you don’t have control over is how long it takes to setup your particular brand of pipe threader and how fast it cuts threads. There is a surprisingly large labor time variance between equipment, that’s why you’ll often see 3 different companies bid the exact same job but have labor estimates all over the board. A specialized gas piping company like J&M Gas Piping Services can often complete a gas line installation in literally half the time of a fully mechanical HVAC or Plumbing company that only installs gas piping “on the side”. A) Is their machine fully portable and fully assembled and “ready to go” upon arrival of the job? B) Does it have a fully self-contained & self-oiling die head system? Or is the machine they use a “dinosaur” that involves assembling a tripod & head unit upon arrival and must be oiled by hand which is messier but more importantly to you and your wallet, takes twice as long as a high end self oiling pipe threader. Brand of Flexible Gas Piping or “CSST” used by the Contractor is a major variable in new Gas Line Installation Costs!! The last item on our list of things to ask prospective Gas Piping installation Contractors is what Brand of Corrugated Stainless Steel Tubing or CSST they use? I’m probably going to get some heat from our supplier for saying this, but in my opinion there are TWO top Brands of CSST that I would be morally comfortable with having installed in my Home. Gastite Brand CSST Flexible Gas Piping is the safest product on the market! Both of the above listed CSST manufacturers require additional licensing to purchase or install their products. After using every imaginable flexible gas piping product on the market, I would never install anything that didn’t meet the standards of Tracpipe or Gastite. We prefer Gastite as it has the highest safety standards of any CSST product currently available and has excellent customer service & support including gas system design & sizing. I’ve personally replaced 100’s of feet other randomly installated inferior CSST brands. I’ve seen leaky fittings years or months after installation, I’ve seen the thinner walls of cheaper CSST punctured by nails, screws, and even regular household picture hangers and staples. That’s not something I want in my home, and no way as a Professional Gas Piping Contractor would I install something with known durability & safety issues into any of my Customer’s homes! The other Brands of CSST are of course cheaper, so many Contractors just can’t resist using them. Ask any potential Gas Line Installation Company what brand of CSST they use, and if it isn’t Tracpipe or Gastite, take the time to look it up and check reviews or just take the safe route and move on to a different Contractor. Quick Note: If the CSST Manufacturer doesn’t require any additional licensing or their training consists of reading a few paragraphs on their website and clicking “Yes, I want to be Certified”, I would consider that a No-Go for installing in my home or anyone else’s. If you’re looking to have a Tankless Water Heater rated at 199K BTU installed, you can expect a jump in gas line installation costs. Same scenario if you are adding more than 1 new gas appliance and the combined BTU load requires a larger diameter gas line. Larger diameter black iron pipe & fittings cost more and also take longer to thread and install. Larger BTU loads like a Tankless Water Heater will often require 1 ¼” piping, whereas a gas line to a clothes dryer might only be ¾” or even ½” diameter piping. It takes more “oomph” to securely tighten fittings on the larger diameter piping, which means bringing out the big wrenches! CSST fittings & flexible tubing are especially more costly as pipe diameter increases. This is where you as the consumer should be educated and make sure your Contractor isn’t cutting corners on sizing or using inferior brands of flexible piping! ALL gas line installations MUST be Pressure Tested & Inspected by the local Jurisdiction, but that doesn’t mean the Inspector is going to catch everything or know the difference in CSST quality between Brands. Here’s a list of common gas line installations and their costs in the Portland Metro Area. NOTE: Does not include costs of Gas Line Permit. In our area, permits for residential gas piping installations range from $42 – $184. Most Companies charge a small permit processing fee ranging from $95 – $195 to obtain the Permits. Quick Tip; Some Companies “Bundle” the actual Permit costs plus their permit processing fee into one price. While there’s nothing wrong with this method of pricing, make sure to find out the actual costs of the Permit so you can determine whether or not their permit processing fee is fair. If the permit only costs $50, you shouldn’t be paying anymore than $145-$250 total for the “Bundled Permit Costs”. -Does not include the price of having a new gas line installed for Logsets or Fireplace Inserts in already existing Masonry. Installing new gas lines into existing Brick Fireplaces presents unique challenges and therefore wider ranging costs. -All prices listed are for piping within the home and do not include underground gas line installations. There are many variables for underground gas piping, making it more difficult to post average installation costs. 7 Important things to ask a Gas Line Installation Contractor before hiring them! I hope you’ve found this article to be helpful and informative! Great – I should certainly pronounce, impressed with your website. I had no trouble navigating through all tabs as well as related info ended up being truly easy to do to access. I recently found what I hoped for before you know it at all. Reasonably unusual. Is likely to appreciate it for those who add forums or anything, web site theme . a tones way for your customer to communicate. Nice task..
Je pourrais vous en transfrer les adresses pour plus de picto en relation avec cette question. Ecrivez moi par mail. Good ?V I should certainly pronounce, impressed with your website. I had no trouble navigating through all the tabs and related info ended up being truly simple to do to access. I recently found what I hoped for before you know it at all. Quite unusual. Is likely to appreciate it for those who add forums or something, website theme . a tones way for your client to communicate. Excellent task..
Great goods from you, man. I’ve understand your stuff previous to and you are just extremely great. I actually like what you’ve acquired here, certainly like what you’re stating and the way in which you say it. You make it entertaining and you still take care of to keep it wise. I cant wait to read far more from you. This is really a wonderful site. I think other website proprietors should take this internet site as an model, very clean and good user friendly pattern. I am typically to running a blog and i really respect your content. The article has really peaks my interest. I’m going to bookmark your site and hold checking for brand spanking new information. Your style is so unique in comparison to other folks I have read stuff from. Thank you for posting when you’ve got the opportunity, Guess I will just book mark this site. Great blog! Do you have any helpful hints for aspiring writers? I’m hoping to start my own blog soon but I’m a little lost on everything. Would you propose starting with a free platform like WordPress or go for a paid option? There are so many choices out there that I’m completely overwhelmed .. Any tips? Thanks a lot! This is the suitable weblog for anybody who needs to search out out about this topic. You understand so much its nearly arduous to argue with you (not that I truly would need…HaHa). You undoubtedly put a brand new spin on a topic thats been written about for years. Great stuff, simply nice! I am writing to make you know of the exceptional experience my friend’s child found reading through your webblog. She picked up so many pieces, including what it is like to have a marvelous helping spirit to have certain people effortlessly fully grasp specific very confusing topics. You really surpassed visitors’ expected results. I appreciate you for churning out the valuable, dependable, informative and in addition cool guidance on that topic to Jane. Keep up the fantastic work, I read few posts on this internet site and I conceive that your site is real interesting and has circles of fantastic info . I have been exploring for a bit for any high-quality articles or weblog posts on this sort of house . Exploring in Yahoo I ultimately stumbled upon this site. Reading this information So i¦m happy to express that I have an incredibly good uncanny feeling I found out just what I needed. I so much unquestionably will make sure to don¦t forget this web site and provides it a glance regularly. Hi my friend! I wish to say that this post is awesome, great written and include almost all important infos. I would like to look more posts like this . Sincere Ogni debole ha sempre il suo tiranno. Hello, Neat post. There’s a problem with your website in internet explorer, could check this?K IE still is the marketplace leader and a good component to other folks will pass over your excellent writing because of this problem.